The head of the Catholic Church in Ireland has said a "valley of tears" has been caused by the death of three teenagers at a hotel in County Tyrone. Speaking at the funeral for Morgan Barnard, 17, Archbishop Eamon Martin described the anguish felt by relatives and friends of the children. Morgan, Lauren Bullock, 17, and Connor Currie, 16, died after a crush at the Greenvale Hotel in Cookstown. Hundreds of young people were queuing to get into the St Patrick's Day disco. Two men, including the hotel owner Michael McElhatton, were arrested on Tuesday on suspicion of manslaughter. Mr McElhatton, 52, has since been released on police bail, as has the other man, who is aged 40. Guards of honour were held at all three funerals. Among the mourners at Morgan's funeral at St Patrick's Church in Dungannon, County Tyrone, were pupils from schools in the town and neighbouring Cookstown and Coalisland. It was a day when young people clung to everything they could to try to bring some comfort. A friend of Morgan Barnard looked at the teenager's picture on the front of the funeral order of service, shook his head, wiped a tear and said: "We were lucky to have him." Between them, the three young victims only lived for 50 years. There were three separate funerals in Dungannon, Donaghmore and Edendork. Many people in the area travelled between the three areas in order to be able to offer their condolences to all three families. Archbishop Martin said: "Words fail us at times like this. "All that really matters and makes a difference is love and friendship and compassion. "The shocking events of Sunday last have reminded us that life is very fragile; we need to cherish every moment and always look for each other and keep each other safe," he added. 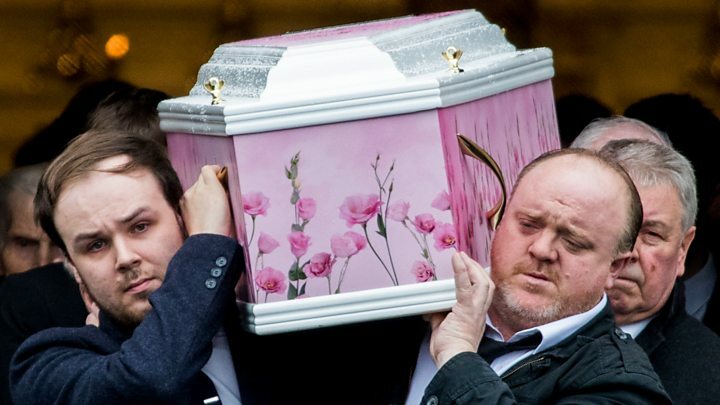 Father Aidan McCann, the curate of Dungannon, said Morgan was "a vivacious, charismatic and energetic young man who nobody had a bad word to say about. Media captionOn St Patrick's Day, a crush outside a disco in Cookstown killed Lauren Bullock, Morgan Barnard and Connor Currie. "Morgan was a person of character with a great sense of humour with an abundance of wit, always a smile on his face." School pupils at the funeral service for Lauren at St Patrick's Church in Donaghmore, County Tyrone, wore purple ribbons in tribute to the teenager who was an accomplished cheerleader with the Euphoria Allstate Group. Friends and family members carried her pink floral coffin into the church. In his homily, Fr David Moore said St Patrick's Day 2019 would be remembered as the "awful day when three beautiful young people were overpowered, literally, in the mad rush of our modern world and needlessly lost their lives". Lauren was a girl with a positive outlook on life, he said. "She was a girl who was happiest when she was doing things to help others and gave of herself and her time to do a good deed whenever and wherever she could," he added. Connor Currie's funeral at St Malachy's Church in Edendork, County Tyrone, was the last of the three to take place. Fr Kevin Donaghy said friends had remembered how Connor "lit up a room as he entered it and his infectious smile warmed everyone's hearts". He said the Armagh-born teenager was a "star on the football field" as well as a "conscientious student who had his sights set on doing accountancy". "He recently went to the McKenna Cup Final with his Tyrone top on but before leaving he let his Armagh-born mother have a peep to see that he had an Armagh top on underneath the Tyrone one," added the priest. "Connor was going to be a winner either way." 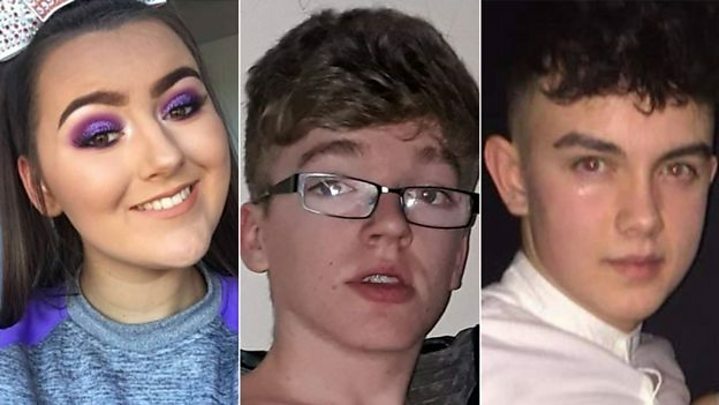 The teenagers' deaths have sparked a major police investigation - the Police Service of Northern Ireland (PSNI) has identified more than 400 young people who were in the queue or the car park on the night. Det Ch Supt Raymond Murray said that while most potential witnesses had been identified, if any more were "still out there" they should come forward.